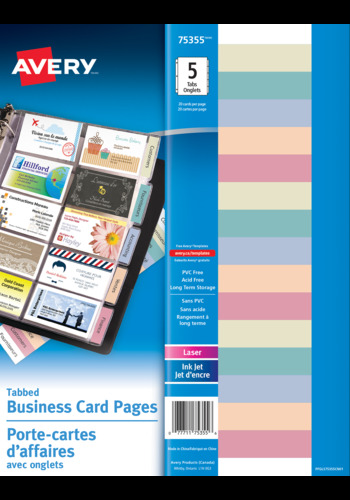 Keep your contacts and business network organized with Business Card Holder Pages. Tabbed sheets are prepunched for storage in a three-ring binder for easy reference and organization. Each business card holder page can hold up to 20 business cards, with 10 cards per side. Keep your contacts and business network organized with Business Card Holder Pages. Tabbed sheets are prepunched for storage in a three-ring binder for easy reference and organization. Each business card holder page can hold up to 20 business cards, with 10 cards per side. After organizing cards, use Avery® Design and Print templates to print tabs and slide into tab inserts to organize your contacts alphabetically, categorically, or however you wish. The durable non-stick, PVC-free holders offer study protection. Made of a PVC-free, acid-free and archival-safe polypropylene material that will keep business cards in top condition. You'll be successful in organizing your network with these pages. Also available in untabbed version (75353).